Oren Moverman’s The Dinner concerns the prejudiced actions of a pair of young men born into privilege, and how the film confronts that prejudice and their privilege is, perhaps, a bit short-sighted. Their respective parents meet at a grotesquely high-end restaurant to dine and to discuss options for this period in which the boys’ involvement is still a secret, despite video evidence. Through a welcome sense of maturity, Moverman’s screenplay (based on a novel by Herman Koch that has been adapted twice previously in Italy and the Netherlands) does, indeed, confront its loaded ideas and its characters’ folly and frailty. It’s also quite graceless in how it does so. The fact of the matter is that Michael (Charlie Plummer) and Rick (Seamus Davey-Fitzpatrick) committed a horrific crime (with one of them complicit in the very commitment of the act and the other implicit in his inability and unwillingness to stop it), and that should be all that matters to Moverman and to the characters, who spend a lot of time dancing around this fact until it is revealed to the audience what exactly transpired. It was an ugly act of gruesome proportions, brought about by two kinds of prejudice, and the film bravely does not back away from where they might have learned these prejudices. Like the act of violence, this is a cruel, sometimes ugly movie, too, although that’s not necessarily a problem on the face of it. The problem is that there isn’t a single character here who is worthy of our sympathy. The boys are pathetic and mean-spirited, and the parents don’t fare at all better. Michael’s parents are Paul (Steve Coogan), a history teacher, and Claire Lohman (Laura Linney), who have prided themselves on their son, the only child they plan to have after a tumultuous pregnancy and a long illness. Rick’s parents are Stan (Richard Gere), up for election as governor, and his much younger wife Katelyn (Rebecca Hall), who is Rick’s stepmother after Barbara (Chloë Sevigny, very good in a small but potent role). Paul is obsessed with the Civil War, having spent months researching the battle at Gettysburg, and this has led him down a path of possible prejudice that Michael has inherited. Stan is proposing legislation geared toward the underprivileged, and perhaps some lingering resentment has given Rick a righteous awareness of his class status. Whatever the case, this is a cynical movie about the division in racial and class structure that approaches such prickly social politics through the obvious measure of characters talking them. There’s plenty of distraction from this point, though, especially in the film’s love affair with the restaurant at which they are dining, which includes an intrusive serving staff (Michael Chernus is amusingly exasperated as one of the managers, who breathlessly explains every aspect of their meal courses), and in the film’s reliance on flashback, which shows us the crime in explicit detail but also wanders a lot in attempting to provide for us the insight into these characters that is necessary to warm up to them. For their part, the actors do quite well. Gere and Hall are just right as the upper-upper-class well-doers of society, and Linney is a ball of nerves on the edge of implosion as the desperate mother who might know more about the crime than she’s letting on. Coogan, though, is the MVP in an exceptionally internalized turn as Paul, who is bitter after years of teaching kids he hates about things he knows too well and has known for far too long. 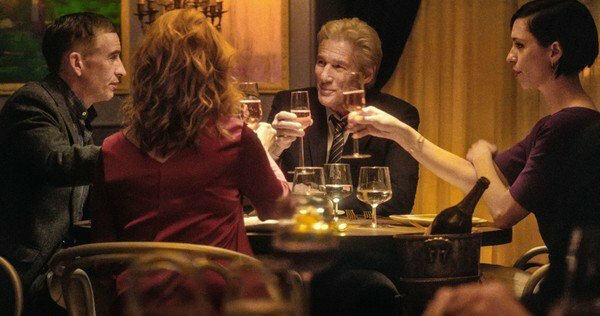 Good performances (and burnished, gorgeous cinematography by Bobby Bukowski that takes advantage of the lantern-lit textures of the restaurant), though, cannot reconcile the shaggy, unfocused trajectory of The Dinner.